We are old souls – like the phoenix – reborn with our ancient knowledge still to be discovered within. 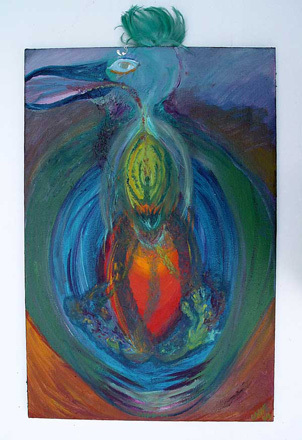 I have been on a ten year journey with the appearance in my paintings of eggs, ova, and seeds patiently waiting to be fertilized, moved through the canals, gestated, birthed and mothered. An endless path inward to the knowledge and experiences stored deep inside. An on-going labor to birth my Self. (There is even a C-section painting). Besides getting the obvious meaning & importance of the birthing imagery, the exact nature of it all remained elusive. What was the self that was being born? Would I know it when I saw it? Mysteries continue to abound but a coherent whole has begun to emerge with time and on-going healing and delving work on many levels, not just the painting. Finally there began to be paintings here and there that gave me a sense of who I was borning – what I was becoming: Manifesting, Calling the Elements, Magical Stance, Solstice Birth (yet to be posted) felt like important evidence of a completed birth. Artist, priestess, greenwitch. However, like the proverbial onion, there are always more layers to be peeled. Always new selves to be born. The journey is indeed endless. Rebirth after rebirth. This painting was done as yet another exploration of my on-going food issues. I was trying to get a glimpse of what was burning and tearing up my insides and trashing my mouth and lips. The painting turned out to be another ova/birth one. Come to find out – the triumphant figure of Calling the Elements is still inside the solar plexus. My liver and gall bladder, spleen, stomach and friends are calling for continued purification and continued vigilance about the sources of my food and how I eat it. At first I thought this painting looked like a terribly sick bird. A scary travesty of the Phoenix painting. I felt discouraged and sad. But a friend pointed out that it looked newly hatched which cheered me immensely. That was when I added the green figure. We all are so new to this work – this dawning age of integration and peace.